This is my fourth in a series of posts about livor mortis/fixed lividity (first post; second post; third post). I've made two claims: (1) it is unlikely that a body could be on its side for about five hours after death and exhibit solely anterior (frontal) lividity with no lateral (side) lividity; and (2) it is unlikely that a body could be buried on its side about five hours after death and exhibit solely anterior (frontal) lividity with no lateral (side) lividity. These claims have particular relevance for the case discussed in the Serial Podcast: the death of Hae Min Lee. The State's contention was that the 5'8" Lee was strangled by Adnan Syed, placed in the trunk of her 1998 Nissan Sentra for about five hours, and then buried in Leakin Park. The State's key witness said on at least one occasion that Lee was "pretzeled up" in the trunk (ostensibly on her side), which would seem to have to be the case because the rear passenger compartment of a 1998 Sentra was 48 inches wide. When Lee's body was discovered in Leakin Park weeks later, it was on its right side and had fixed frontal lividity, which was also consistent with the key witness's testimony on at least one occasion that Lee was buried on her right side. Based on prior information I'd read and received, I already felt strongly about both of my claims. I also felt strongly that if Adnan's trial attorney had pressed the doctor who prepared the autopsy report for Lee on these two issues, she would have given responses that would have hugely helped the defense. But you never know. Well, now I do. Part of this is based upon a particular case from that doctor's past, which I will discuss today. Part of this is the responses I've gotten from people who know their forensic pathology, which I will discuss tomorrow. Let's start with the doctor who prepared Lee's autopsy report: Assistant Medical Examiner Margarita A. Korell, M.D. Back in 1988, she became involved in the case Wiggins v. State, 597 A.2d 1359 (Md. 1991). In Wiggins, the State had pretty strong evidence that Kevin Wiggins robbed 77-year old Florence Lacs at her apartment on September 15, 1988. Lacs was later found in the filled bathtub in her apartment on September 17th and pronounced dead that same day at 3:50 P.M. Dr. Korell performed the autopsy on Lacs's body. The autopsy noted, inter alia, that (1) there was fixed lividity in areas such as the insides and backs of the arms that was consistent with death in the bathtub; and (2) rigor mortis was fully developed and had been broken. Prior to trial, one of Wiggins's attorneys interviewed Dr. Korell and asked her whether she could prescribe a range of time of death. "Dr. Korell told defense counsel that the victim died from four to ten hours before her body was discovered on September 17, and that the outside limit was twenty-four hours." Two days later, however, Dr. Korell called and said that "she had changed her opinion as to time of death. She apparently told [the attorney] that, after consulting with a 'female supervisor' whom she would not name, she came to believe that death could have occurred up to 48 hours prior to discovery of the body." Q. And can one determine a range in which someone was actually killed? A. Obviously, the broadest range within which death is noted to have occurred is between the time that an individual is last known alive and when they're found dead. Within that range, one can, by assessing the degree of post mortem changes which have occurred, narrow down that range to something still relatively broad, but one can certainly narrow it down, the range as to time of death. Q. All right. You described anatomical changes. What kind of things do you look for? A. For the most part, again it depends on, to some extent, how long an individual has probably been dead. In the early phase following death, body temperature can be quite useful. Following that, one also assesses the degree of development of rigor mortis, the stiffening of the muscles which occurs in anyone after death -- not just the degree of stiffening, but whether rigor mortis is fully developed. These changes take place within an average period of time. Q. Okay. Is the environment in which the body is found, does that affect these factors which you've described? A. Yes, the environment is crucial in terms of the post mortem changes and the time it takes for them to develop. Q. A body found in water, does that affect a time of death in an attempt to ascertain a time of death? A. Typically, if a body is found in cold water, the post mortem changes will be slowed down to some extent as opposed to a body found in the, you know, in a room at room temperature. Q. Now, you also testified, you described one of the things that you would look for would be fixed lividity. For the members of the jury, could you describe what you mean by that? What is lividity and when does it becomes fixed? A. When the heart stop. pumping blood throughout the body, which obviously occurs when somebody dies. The heart stops. Blood, like any other fluid, will find its own level by gravity. It will settle with gravity. And as the blood settles in the tissues, the body takes on this purplish color because of the blood showing through the skin. As I say, this lividity usually starts to become apparent within two to four hours after death. Sometimes it's little sooner than that. After a period of time, usually not less than eight hours, sometimes a much longer period of time, the pooling of the blood, the lividity will fix in the tissues where it is settled up until about eight hours or so. If one moves a body, if a body is found face down, and four or five hours after death this individual is found and the body is turned over, placed on the back, then the pooling of blood will change direction and start pooling toward the back. But after a period of eight to twelve hours, the blood is fixed in that location. So that moving the body will not alter the distribution of the lividity. Q. Okay. And given the example that you've just given, if someone had fixed lividity on their right side, what could you conclude about where they were when lividity became fixed? A. Lying, obviously, lying on their right side for a period of, considerable period of time following death. Q. Okay. Now, were you able to apply these principles which you've described to Mrs. Lacs' situation? A. The basic alteration which was assessed apart from lividity was fixed, was the presence or, I should say, absence of rigor mortis in Mrs. Lace. Q. Okay. What do you conclude based on that observation? A. Under average conditions, rigor mortis develops over a set period of time. As I say, there are obviously always exceptions. But generally speaking, rigor mortis will be fully developed within 12 to 18 hours. It will usually stay for a period of time and start disappearing somewhere between 24 to 36 hours and will be gone, say, 48 hours following death. This is sort of an average temperature environment, average conditions. Q. A body found in water would vary from those figures by virtue of being in water, correct? Q. Now, based on these principles which you've described and your review of the autopsy which was performed in this case, can you state within a reasonable degree of medical certainty a range of time prior to the autopsy having been performed in which Mrs. Lacs was killed? A. A broad range, yes. A. I would say that the death occurred at least 24 hours prior to, actual, prior to the examination by the Deputy Medical Examiner at the scene, and it could easily have been 36 or 48 hours or even more, based on the body changes. Q. If someone would attempt to testify to a specific period of time, say within four or five hours, is it your opinion that that is possible to do? It seems pretty clear what happened here. First, Dr. Korell underestimated the upper limit (24 hours) for time of death, with her supervisor, Dr. Dixon, correcting her and increasing that upper limit to 48 hours based on rigor mortis. Second, Dr. Korell overestimated the lower limit (four hours) for time of death because she confused the period when lividity starts to become apparent (two to four hours) with the period when lividity becomes fully fixed (eight to twelve hours or more). This mistake is apparent from the last question and answer in the colloquy. What also seems clear is that Dr. Dixon is implying that if a body is in a certain position (e.g., on its side) for "four or five hours after death," some lividity will remain in this area even if the body is moved to another position (e.g., face down). This is consistent with the arguments made in my prior post about moving a body during this period of partially fixed lividity and creating a "mixed" pattern of lividity/dual lividity/second lividity. At the guilt/innocence phase of Wiggins's trial, however, Dr. Korell wasn't nearly as clear as Dr. Dixon about the timeframe for Lacs's time of death. Instead, "Dr. Korell was unable to state, with a reasonable degree of medical certainty or probability, 'what the maximum period of time was.'" But later, at sentencing, Dr. Korell testified about how she had conferred with Dr. Dixon and believed that "the time of death could have been forty-eight hours before the body was discovered." I'm assuming that Dr. Korell read the court's opinion. In a Westlaw search, I only saw her name come up in one appeal before** the appeal in Wiggins: Watters v. State, 578 A.2d 610 (Md. App. 1990), a fairly straightforward affirmance of conviction in which there was merely a one sentence reference to Dr. Korell testifying about cause of death. By way of contrast, I'm pretty certain that Dr. Korell would have been highly interested in reading about what Maryland's highest court had to say about her mistakes concerning livor and rigor mortis and whether they necessitated a new trial. The opinion in Wiggins v. State was released on February 10, 1999. Dr. Korell performed the autopsy on Hae Min Lee on February 10, 1999. I'm betting that if defense counsel had asked Dr. Korell the right questions at trial a year later, Dr. Korell would have (1) testified that lividity couldn't have become fixed in the front of Lee's body earlier than eight hours after death, making a burial on her right side in the 7:00 hour impossible; and (2) testified that Lee being on her side in the trunk of her Sentra for about five hours after death would have resulted in there being at least some lividity on her side or front right at the time her body was discovered. But I don't really have to make these bets. This is because I know what effective counsel should have done. We know that trial counsel's Spidey-sense was triggered based upon her cross-examination of Dr. Korell at trial about Lee's fixed frontal lividity and whether it could be consistent with a side burial (it couldn't). But there was no follow-through. Counsel: Dr. Korell, you prepared an autopsy report in the Wiggins case in which fixed lividity was important, and your supervisor, the Deputy Chief Medical Examiner, testified about that report at trial. Now, I'm assuming your conclusions about lividity here today will be the same as hers, but let me just make sure. Lividity starts to become partially fixed two to four hours after death and sometimes a little sooner than that. Is that correct? Counsel: And if a victim is on her side for about four or five hours after death before being moved to a face down position, because of the partial fixation of lividity, some of the blood would remain pooled on the side while some of the blood would pool to the front. Is that correct? Counsel: But it's impossible for lividity to become permanently fixed in four or five hours, is that correct? Counsel: Right, instead, lividity cannot become fully fixed until at least 8-12 hours after death, is that correct? Counsel: And when temperatures are colder, as they were on January 13th before a massive ice storm struck soon after midnight, it can take lividity longer to become fully fixed, is that correct? Counsel: Therefore, given the circumstances in this case, it's easy to imagine lividity not becoming fully fixed until, say 14 or 15 hours after death, is that correct? Counsel: Now, your autopsy lists fixed frontal lividity, without any mention of any lividity on the sides of the body, is that correct? Counsel: The State's key witness has claimed that the victim was on her side in the trunk of her Nissan Sentra for about five hours after being killed. Given that you only saw fixed frontal lividity, is that likely given what you said before? Counsel: And the State is claiming that the victim was buried in the 7:00 hour, approximately five hours after death. If the victim were buried on her right side in the same position that she were found, would that be possible given her fixed frontal lividity? Counsel: And, in fact, based on the weather conditions on January 13th, it's likely that lividity didn't become fully fixed until at least, say, 14-15 hours after death, which would mean that the burial couldn't have happened before 4:30 A.M. on January 14th, is that correct? By doing this, the trunk story is out, unless you think Lee could have been face down in the trunk of her Sentra, which is unlikely. A burial in the 7:00 (or 8:00 or 9:00) hour is out, unless you think Lee was repositioned after burial. The only evidence supporting this is one version of events told by the State's key witness, whose credibility regarding the burial would have been shot based on the above. 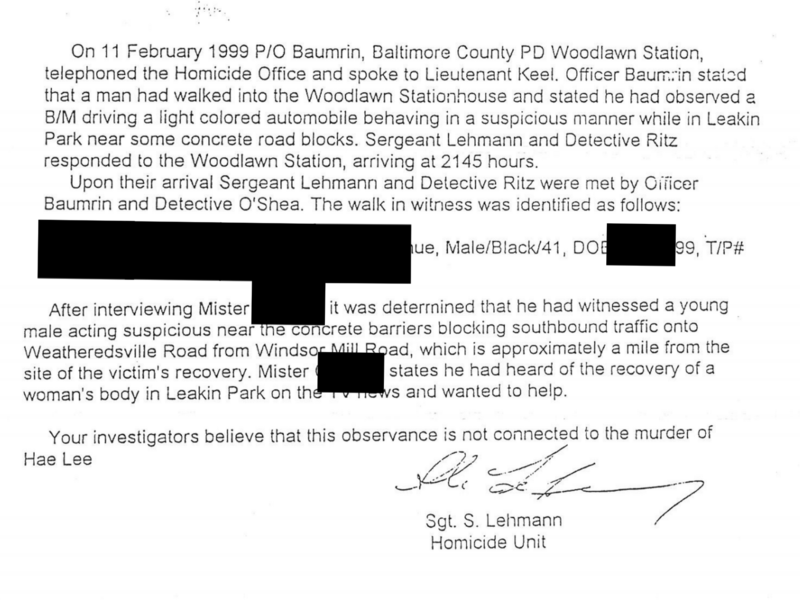 Actually, there is a second piece of evidence: a report of a B/M (black male) acting suspiciously near the concrete barriers outside Leakin Park after Lee had been buried there. But I'm guessing that doesn't help the State's case. Also, the above Q&A creates the very real possibility that Lee wasn't buried for several days because it's quite possible her lividity wasn't fixed until after the ice storm started at 4:30 A.M. on January 14th. Put simply, something like the above cross-examination casts some serious doubt on the State's case. *In Wiggins v. Corcoran, 164 F.Supp.2d 538 (D.Md. 2001), the United States District Court later granted Wiggins habeas relief based upon, inter alia, the insufficient evidence of his guilt, including the problems that Dr. Korell had regarding the shifting time of death. In Wiggins v. Corcoran, 288 F.3d 629 (4th Cir. 2002), the United States Court of Appeals for the Fourth Circuit reversed the district court, finding that the jury could have found Wiggins guilty beyond a reasonable doubt based on the evidence, despite issues such as Dr. Korell's testimony. In Wiggins v. Smith, 539 U.S. 510 (2003), the United States Supreme Court reinstated the district court's grant of habeas relief, but only with regard to the sentence imposed. On February 9, Drs. Steven Robinson and Margarita A. Korell of the Office of the Chief Medical Examiner performed an autopsy; on June 19, they reported their findings to the Baltimore County State's Attorney's Office. This report identified the cause of death as "blunt force injuries to head" and the manner of death as "undetermined," rather than as homicide. On September 9, 1998, Dr. Korell and Dr. John E. Smialek, the Chief Medical Examiner, submitted a supplemental report which identified the manner of death as homicide due to "blunt force head injuries" At trial, the State did not call any physician from the medical examiner's office, but instead entered in evidence the autopsy and supplemental reports as a public record....Deese called Dr. Korell in his case in chief, questioning her about the changed opinion as to the manner of death. Dr. Korell admitted to having met with prosecutors and police before filing the supplemental report and that new medical tests did not account for the change. On cross-examination by the State, Dr. Korell explained that she was "suspicious from day one," but was waiting to receive an "alternate explanation" as to how Kyle had been bruised; after no such explanation was forthcoming, she concluded that the manner of death was homicide. I could've sworn you said that you were done blogging about this. I guess attention gets addictive. Be careful about ruling out the trunk - it isn't an impossibility for Hae to have been in the trunk for several hours without any fixed lividity on her side. The exact time frame established at trial? Most likely not - but completely ruling out that the body was in the trunk for some time period is not possible. However, spot on that you can completely rule out a 7pm side burial and that is the bigger piece of evidence knocked down. Professor, I keep seeing HML's height posted as 5'8" including in your post above. The autopsy report states height as 5'6". It seems as though there is an underlying supposition among all of these arguments that I, personally, haven't seen addressed anywhere. To be clear, I have spent nowhere near as much time as many people digging into the details -- but why must we make the assumption that Hae was already dead when she was put in the trunk? Could it be possible that she was strangled until she lost consciousness and even further, to the point at which someone might think she was dead. Then whoever strangled her freaked out, shoved her in the trunk, then unknowingly allowed her to die a slower death in the trunk? To be clear, I pray this wasn't the case and that however she died it was as quick as possible to minimize suffering. But based on what I've seen, I don't find it unreasonable to question whether or not she was actually dead when placed in the trunk. The idea that the body was repositioned after burial is bizarre and highly unlikely. The risks alone would seem to rule this out not to mention having to once again deal with a corpse. However, the body could have been secreted face-down behind the large log at the eventual burial site within a few hours of death before actual burial. Possibly from 4:00 pm to well after 11:00 pm. This doesn't mean she was never in the trunk. Not at all. But it's possible that the 7:00 -ish pings in Leakin Park occurred when initial attempts at digging a grave were underway and subsequently abandoned; then finished-off closer to midnight when the body was actually pushed and rolled into the grave and ended up on its right side. Incidentally when the body was disinterred it was rolled out of the grave onto the body bag. For what it's worth, the body was found with one of the knees bent, which knee was not specified. The problem I've always had with the car is that there were zero forensics from a dead body found either in the front or the trunk or anywhere in that car, which might lend some credence to the theory that she was not murdered in the actual car. I doubt that a "wiping down" of the car could clear up bodily fluids without leaving at least some evidence that powerful cleaning agents had been employed. I was disappointed that CM was on the right track in her question of the ME but failed to land the punch. She also did not ask about stomach contents, neither was anything mentioned in the autopsy report—but she may not have wanted to go there. Jonathan M and Jack: I haven't explored the possibly of a chest/face down placement in the trunk. As you note, it might be possible but wouldn't change my conclusions about a burial in the 7:00 hour. Badger: The autopsy had her at 5'6". Other sources have said 5'8". I guess either could be right, and there's not a huge difference between the two. Jen: The death could have been later, but that would simply push back the earliest burial time. The yoga pose linked above would show mixed lividity, wouldn't it? If she was bent forward like that, there would be some sign of lividity in her buttocks and the back of her legs. Comment 1) Someone's jealous that they can't think of searching Findlaw. Muahahahaha. Must be bitter at another pin in prosecution's case gets knocked down. Comment 2) Nice going, Prof. I admit I didn't think of researching her name in Findlaw either. Comment 3) Seems this is further proof that CG was slipping bad. She asked an "either/or" question that doesn't lend itself to yes/no answers as conclusion of lividity stuff in the 2nd trial. I had a thought on what she should have asked, but that's before I saw this case that Korrell was involved in. 4) Who states their *real* height on driver's license? Everybody inflates by an inch or two. Dan: Yes, if she were in that position for 5 hours, I imagine that there would be mixed lividity. ...so, if the body had been face down in Leakin Park between 4:00 pm and say 12:00 midnight. (We can't be sure to say exact burial time - it could have been 12:30 pm or even 100 am. It is possible that frontal lividity was fixed. Jonathan M: that yoga pose seems like it would lead to lividity in the face and back of legs, *not* on the anterior torso where it mostly occurred. Badger: That's true, but then they're unloading a body next to a moderately busy road at the start of rush hour in broad daylight. I was tickled by Professor's link to urban dictionary. First off, I doubt that who ever killed her would take the time to put her into a yoga pose to fit in the trunk. The professor is correct the lividity would be in different areas. If she was not dead at the time of the trunk would make the states time absolutely off as her heart would still be pumping and there would have been no lividity until much later. Prof, did you know that there is some code (a "refresh" meta-tag) in your blog that reloads the page every 400 seconds? Makes it really hard to compose a comment on the page (3rd attempt being written in Notepad). I wanted to thank you for your educational posts. I enjoyed Serial because it was a healthy reminder that certainty is hard to come by, that we need to educate ourselves beyond what we are told, look harder at all of the evidence and be wary of what appears to be simple at first glance. You and Susan are providing some of the "science/logic-that-should-have-been", lending texture to a story that has stoked my curiosity. I wonder if the refresh thing was part of Typepad injecting some ad revenue. Annoying, yes. Amber and K. Chang: Yes, it is from Typepad. I wish that I could disable it, but I have no control over it. Apart from Jay's testimony there is no actual evidence that I can find that shows that Hae was in the trunk of her car. The best that can be said is that IF she was in the trunk, it was only for a few hours after death - probably less than 2 hours. The fixed lividity shows us she was stored in a position that was not compatible with a small trunk of a car (the yoga pose is ludicrous on all sorts of levels).